The website cites delays in integrating SpaceIL’s spacecraft with other payloads aboard the Falcon 9 as a reason for the delay. The competition has a $20 million grand prize for the first private team to land a rover or hopper on the moon that would travel 500 meters across the surface while returning high-definition video to Earth. There is a $5 million prize for the second team to accomplish that goal. An addition $5 million in prize money is available to teams that achieving various tasks on the lunar surface. SpaceIL’s withdrawal would leave four teams left in the competition: Moon Express, Team Indus, HAKUTO and Synergy Moon. All four teams face challenges as the deadline approaches. Moon Express has said it is fully funded to conduct a moon mission. The American team’s entry is set to launch later this year aboard a Rocket Lab Electron booster. That booster is still awaiting its first flight test from a launch site in New Zealand. The test is scheduled in the upcoming months. Team Indus’ rover is scheduled to fly aboard an Indian PSLV booster in late December. The flight of the Indian team’s entry is also set to carry a rover from Japan’s HAKUTO team. Quartz reports that Team Indus is still trying to raise the full $70 million required to complete its rover and pay for the launch. Synergy Moon’s entry is scheduled to fly aboard an Interorbital Systems rocket currently under development in Mojave, Calif. 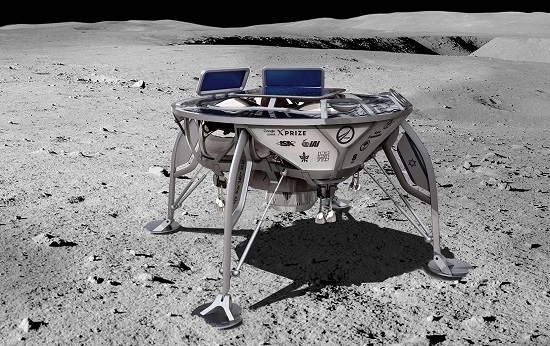 The Google Lunar X Prize original 2012 deadline has been extended several times since the competition was launched in 2007. Prize officials have said this is the final year of the competition. An issue for sponsor Google in extending the prize any further is the cost of paying the X Prize Foundation to continue to run it. A rough rule of thumb is that operating costs for the foundation’s various prizes usually equal the amount of prize money put up. In 2015, the competition awarded milestone payments totaling $5.25 million to Moon Express, HAKUTO, Team Indus and two other teams that have since dropped out of the competition. The milestone payments were not originally part of the competition. At that time, the X Prize said Google had increased its maximum possible financial commitment in prizes from $30 million to $40 million.